One time I was at St Clair during the morning rush hour, trying to get downtown. The train pulled in and it was packed to the gills. It was way too full to get on, but there was a teenager wearing a bulky, enormous knapsack who tried anyway; he shoved forward in front of me. Idiot. He managed to worm his way into the doorway, but his pack was still jutting out behind him outside the train. I hate it when people don’t take off their bags. The doors started to close, but once they hit his backpack they couldn’t go any further, so they opened up again. The south end of the St Clair platform has a noticeable bend. The kid was oblivious that he was holding up everything. He just stood there thinking he was golden. The doors closed again on his backpack; they opened up a 2nd time. The whole train was a metal can of sweaty, impatient human sardines cursing the delay. Right before my eyes—everyone was waiting. This stupid kid! When the Toronto Rockets first arrived here for service, there was a software issue where if the doors failed to close three times in a row, the whole train had to be taken out of service and rebooted. If that happened we’d all be even more late, with the train stuck in the station. So when the doors started closing the third time, it was a spur of the moment decision. I stepped in and physically pushed the pack—and the kid—forward. I heard him yelp as he mashed into the other people in the doorway. I just barely jammed his knapsack in through the doors as they slid closed. 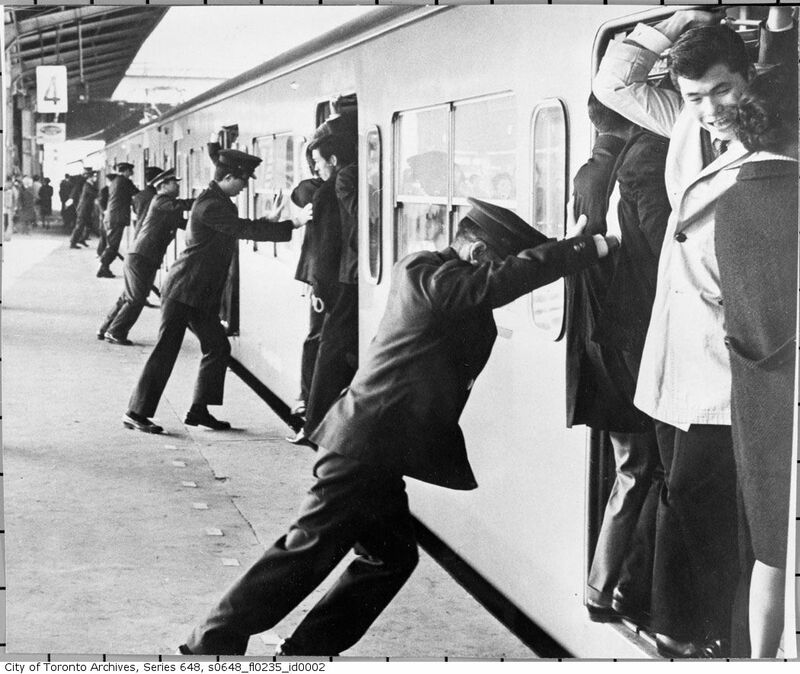 Like one of those Japanese train-pushers. The kid swore and looked around angrily to find out who was the jerk that pushed him—but it was too late—the train started to leave the station. The whole southbound platform at St Clair laughed with me. The distinctive orange tiling at the platform’s north end stairwells: hints of their corporate history? 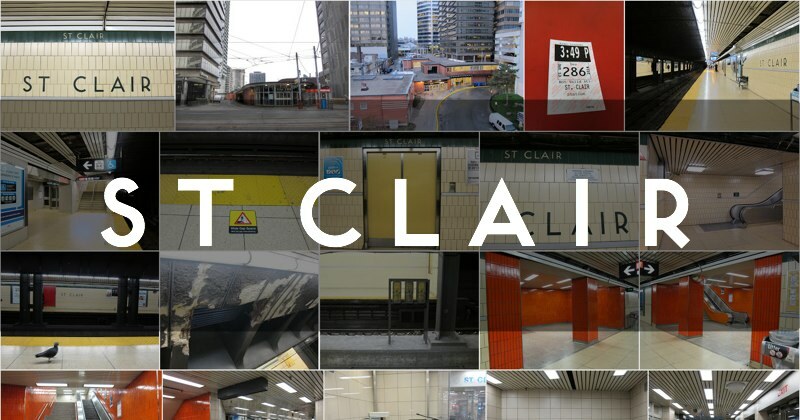 St Clair opened to the public on March 30, 1954 as one of the original Yonge line stations. Besides an integrated McDonald’s restaurant, it features a surprising number of corridors and passageways tucked into it, connecting the subway, bus, and streetcar platforms, each on a different level. In 1965 the air rights above the streetcar and bus loading platform areas were sold for the apartment complex on Pleasant Blvd. The St Clair bus platform with its weird brick cobblestones. ps. Yes, I deliberately omitted the period in ‘St Clair’ for this post when referencing the station. I go by the station tiling. Join me for a lighthearted visual exploration of the Toronto subway network, featuring over 5,000 contemporary photographs and 2,000 captioned historical images! Start here: Welcome to my journey! All non-historical photos and text copyright Nathan Ng — please contact me about usage or licensing..